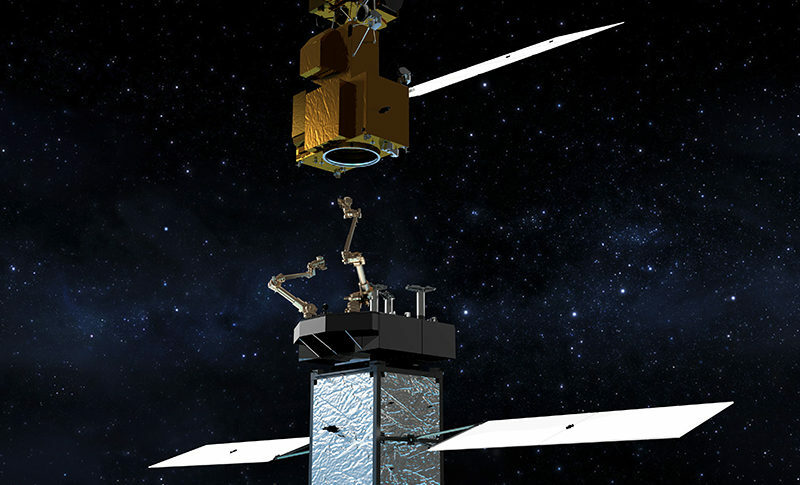 WASHINGTON — A new contract from NASA to build the agency’s Restore-L satellite servicing spacecraft could bring Space Systems Loral that much closer to launching its own satellite servicing business. NASA awarded the contract to SSL Dec. 5, tasking the company with supplying a chassis, hardware and services for the mission. The Palo Alto, California-based satellite builder is responsible for supporting integration, test, launch and operations. The purpose of Restore-L is to demonstrate the ability to refuel a satellite in orbit, including those not designed to have their fuel tanks opened in space. In-orbit refueling has the potential to extend the lives of otherwise healthy spacecraft that have exhausted their propellants. SSL, with parent company MDA of Canada, has been actively entertaining the notion of launching a commercial in-orbit servicing business, one that would combine MDA’s past experience from the almost-launched Space Infrastructure Services system in the early 2010s with SSL’s knowledge of satellite manufacturing. Steve Oldham, the former president of MDA’s Space Infrastructure Services division who currently leads strategic business development at SSL, said the company has interest from prospective customers in using an SSL-built servicer, and that the MDA board of directors expects to make a decision on relaunching such a business through SSL in the very near future. SSL has been steadily accruing space robotics experience through other government programs with NASA and the Defense Advanced Research Projects Agency (DARPA). The Restore-L contract adds to that base, especially given NASA’s intentions of transferring technology from the program to commercial entities. Restore-L is intended for launch in 2020, after which NASA will direct the spacecraft to dock with Landsat-7 in low Earth orbit for a test flight. Landsat-7 launched in 1999 aboard a Delta 2 rocket, and will have been in orbit for more than two decades based on current mission timelines. NASA’s contract with SSL has a maximum value of $127 million and includes a three-year core period coupled with a two-year indefinite-delivery/indefinite-quantity portion. The agency’s Satellite Servicing Projects Division at Goddard Space Flight Center, Greenbelt, Maryland, is managing Restore-L. Along with in-orbit fueling, the agency believes Restore-L can potentially contribute to in-orbit repairs, spacecraft assembly, de-orbiting and debris removal.